A New Idea for Painting Parties for Personal & Corporate Entertainment. Every so often a wonderful new idea comes along that makes you think "Wow! That sounds fun!" Well that's exactly what ART JAMMING is - fantastic fun. Invented by Dublin artist Deirdre Geraghty, who incidentally is no mean painter, art jamming is something anyone can do, almost anywhere. And with the help of her company Art Jam Ireland, you can do it with your friends, your work colleagues, your customers, your kids - with almost anyone you can think of. And you don't have to clear up afterwards! What Exactly is An Art Jam? 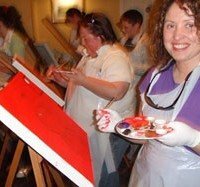 It's a painting session, usually lasting about 2 hours, involving a group of ten or more people, who get together in order to have fun painting. All easels, canvases, paints, brushes, sponges, spatulas, aprons, and floor coverings are provided, as well as tons of personal help, and everyone gets to take home their own piece of artwork. Do You Have to Be a Good Painter? Absolutely not. No artistic skills of ANY kind are needed to participate. That's the nice thing about art jamming: anyone can do it. So don't worry if you haven't picked up a brush since school. What's more, Geraghty says that many participants are surprised and amazed at what they can produce in this fun environment. Almost anywhere that has the space for the numbers participating - home, office, hall, hotel, restaurant, pub, park, beach - the possibilities are endless. Either, you arrange a venue, or Geraghty will organize one for you. PLUS, she'll bring a selection of atmospheric music (rock, acid jazz, mellow) to suit the mood and get those creative juices flowing. It's all taken care of. The paint easily washes off clothes, while Geraghty provides all necessary floor coverings and clears up afterwards. You don't have to do a thing. When Can I Have an Art Jam?  A friend's 40th birthday party, to keep her young.  A great children's party. Remember, there's no clearing up.  Any sort of occasion to help people loosen up and have fun. As most doctors will tell you, painting is great therapy. As well as being very relaxing, it inspires you to be creative and do something totally different for a change. Geraghty says: "It changes people's perceptions of their own limitations and gives people the chance to really express themselves." Art jams are also great ice-breakers, a big benefit for companies seeking to build teamwork and boost morale. They are especially valuable in helping individuals to challenge their comfort zones - a vital element in personal development. Art Jam Ireland has organized a range of sessions for large firms (eg. IBM, Google) which have proved immensely enjoyable and useful. Before each art jam session, the area is set up with easels and canvases, which together with all necessary paints, brushes and aprons, are provided by the company. Music is also provided. After deciding on a subject, the participants get creative for two hours and afterwards they can take home their artwork. Art Jam Ireland takes care of all the clean up and, if necessary for a small extra fee, will even deliver your paintings the next day to your house or office. Less than you think, considering the service provided. Prices are €35 per person in the County Dublin area and €45 per person outside. (Minimum 10 People). Art jams for kids are €20 per child. For latest details, check Geraghty's website, below. One of the best ideas I've seen for a long time. Geraghty succeeds in making visual art both fun and accessible and, judging by the photographs on her website, her customers absolutely love it. It's exactly the sort of thing we need, to cheer ourselves up in the present economic climate.  For more information about contemporary visual arts in Ireland, see: Contemporary Irish Artists.  For more about art in Ireland's capital, see: Visual Arts in Dublin.